This is a WOW… I was a just checking out some deals that WalMart.com was offering for Cyber Monday and I found this little golden nugget. 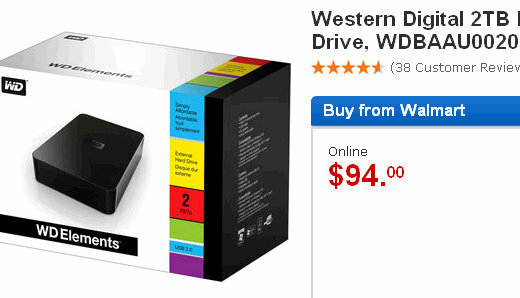 WalMart.com is selling a 2TB (2 Tera Byte) Western Digital external hard drive for only $94. Only $94… that is unbelievable, especially considering that just a couple of years ago you couldn’t get 250GB for that price. It’s amazing how fast the cost of data storage is dropping. As an example, I just purchased 20GB of cloud storage with Google Docs for only $5 per year. You can actually purchase 1TB of cloud storage on Google Docs for only $256 per year. Now that might sound like a lot, but this is cloud storage which means you can access your files anywhere on the web, including your mobile phone. But back to WalMart’s Cyber Monday deal. If you want an amazing deal on an external hard drive, I think you’ll be hard pressed to find a 2TB Western Digital, USB plug and play, external hard drive anywhere for $94. staples has this one for $69.99. Thanks for the good writeup. It in truth used to be a amusement account it. Glance complicated to more introduced agreeable from you! By the way, how could we keep in touch?